COOPER, JAMES FENIMORE. (1789-1851). Prolific and influential American author of the classics The Last of the Mohicans and The Deerslayer. ALS. (“J. Fenimore Cooper”). 1p. 4to. Philadelphia, February 11, 1839. To American businessman JAMES DE PEYSTER OGDEN (1790-1870). $2250. Six months from date I promise to pay to the order of George C. Gibbs. James S. Sandford, & J. Wright Gordon, two thousand two hundred and fifty dollars, with interest, for value received, payable at the office of the North American Banking and Trust Company in the city of New York. Signed – Sidney Ketchum. There you have a facsimile of the note, which has just got back. 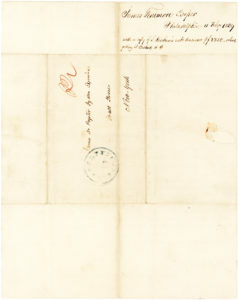 Comstock suspects that the note will be paid, and says it is the best that can be given [?] in Michigan. I wait your answer. 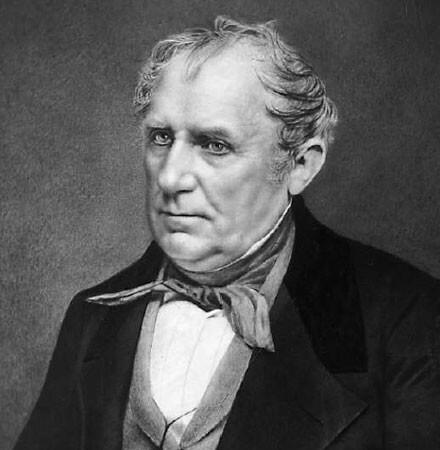 James Fenimore Cooper was the son of American merchant, land speculator and Congressman William Cooper, founder of Cooperstown in New York’s Otsego County, in the Mohawk Valley. It was on the shores of Otsego Lake, surrounded by the Mohawk, Onondaga, Oneida, Cayuga, Seneca, and Tuscarora nations, collectively known as the Iroquois Confederacy, that Cooper spent his formative years. 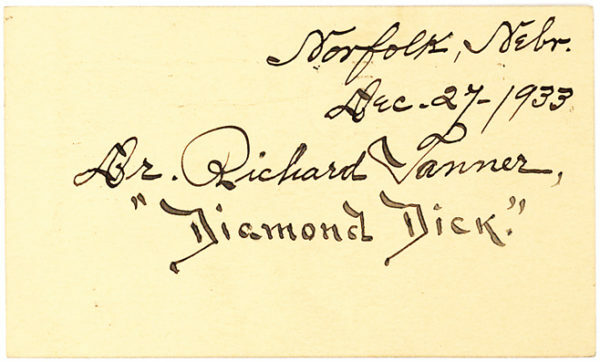 He briefly attended Yale and worked aboard a merchant ship before inheriting his father’s estate and marrying Susan Augusta de Lancey, who first challenged him to try his hand at writing a novel, which he did in 1820. Finding success with Precaution, a work fashioned after Jane Austen, Cooper became a prolific author, publishing The Pioneers, the first of his Leatherstocking novels, in 1823. 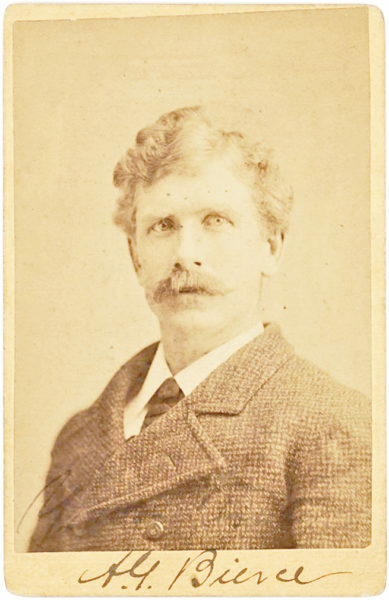 After spending more than a decade living with his family in Europe, Cooper returned to Cooperstown in 1834, frequently visiting New York City and Philadelphia. 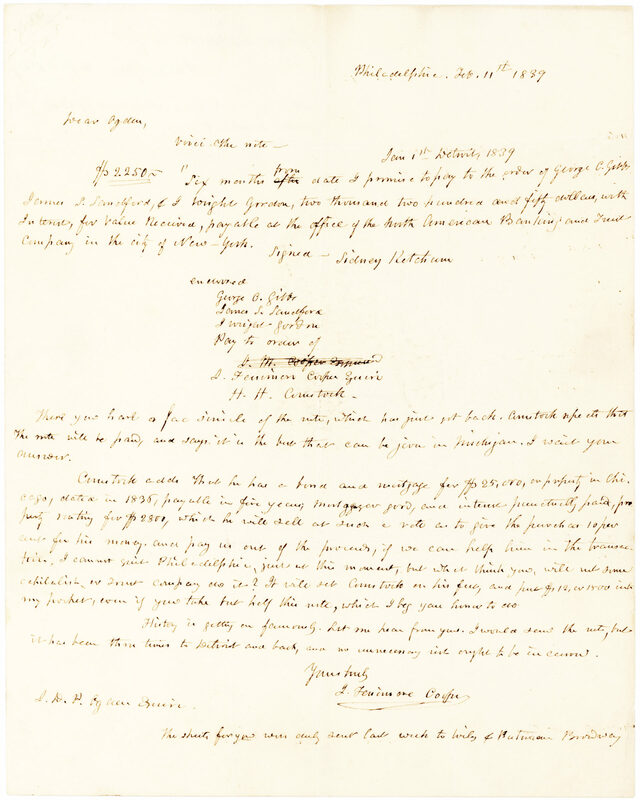 Cooper is writing to a New York businessman involved in the cotton trade with whom he invested in cotton as well as Western lands via his nephew by marriage, Horace Hawkins Comstock (c. 1807-?) who had married Cooper’s niece, Sarah Sabina Cooper. “Comstock initially struck Cooper as a ‘respectable young man’… and, long after their dealings had turned sour, Cooper seems never to have lost faith in him,” (James Fenimore Cooper: The Later Years, Franklin). “Comstock had acquired an interest as early as 1831 in lands in Kalamazoo County, Michigan Territory, where he named one township after himself and another after the Cooper family. Soon Comstock persuaded his wife’s uncle to invest in the West himself,” (ibid.). The two men became “equal partners in speculation” with Cooper giving Comstock permission to invest at his discretion on his behalf,” (ibid.). For a time, Ogden and New York Banker Gorham A. Worth were also partners in the investment, before Cooper bought them out. By the fall of 1835, however, with the price of cotton falling, he eagerly sought to recoup his funds, asking Comstock to buy him out as well, something the latter was reluctant or unable to do. When Cooper finally persuaded Comstock to refund his investment, “he could not… pay that amount as soon as Cooper wished, [and] he outlined a plan whereby he would make restitution via four installments spread across the next two years with 7 percent annual interest added,” (ibid.). The terms of the restitution changed several times over the next few years and it is undoubtedly to this matter that our letter refers. By the 1840s, still seeking his funds, Cooper had traveled to Detroit several times, initiating lawsuits in Michigan and New York against those who endorsed the note quoted in our letter, Michigan legislator and, later, member of the Michigan Supreme Court George C. Gibbs; native New Yorker James S. Sandford; and future Michigan Governor J. Wright Gordon (1809-1853). Suits were also brought against Sidney Ketchum (1797-1862), a land surveyor from Clinton County, New York who invested in Michigan territorial properties, and established, in 1836, the first bank in Calhoun County, Michigan. 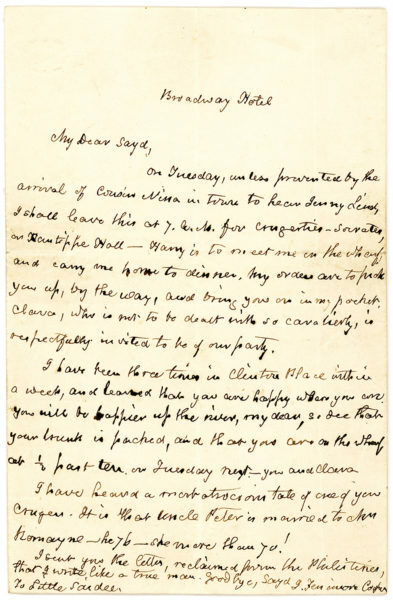 Ogden testified in a number of the legal proceedings, which continued until Cooper’s death. “To be sure, Cooper did make some modest gains from the Comstock entanglement. Even at the time of his death, when a substantial portion of the original debt remained unpaid, Cooper owned more than a dozen lots in Kalamazoo that Sabina and Horace Comstock transferred to him in 1841 to cover some of what they still owed him,” (ibid.). Incidentally, Ogden was twice president of New York’s Saint Nicholas Society, founded by Washington Irving in 1835 and comprised of descendants from New York’s early settlers. Cooper obliquely mentions his History of the Navy of the United States of America, published May 10, 1839, as well as his longtime publisher, Wiley & Putnam. Integral address leaf intact. Folded with normal staining and wear. In very good condition.